By John W. Sinden, Jr. The book Seven Years in Tibet, written by Heinrich Harrer, as well as the film adaptation, illustrates the conversion of the Tibetan independence movement from a Chinese domestic issue into a global household issue. Grossing $93,500,000 Worldwide, the film became a historical backdrop for awareness of Chinese control over Tibet within popular culture. I was only 11 when the film was released, but I became aware of Tibet and the larger issue through discussion, publicity and commercialized trailers without seeing the film. There are five autonomous regions within China, however Tibet is the most recognized of these autonomous regions with a population of nearly 3 million, compared to a population of nearly 20 million in the Xinjiang Uyghur autonomous region. With a population of nearly 17 million more than Tibet, why is the Xinjiang Uyghur Autonomous Region and the Xinjiang independence movement relatively unknown? One of the major differences between the Tibetan and Uyghur populations is religion. The Tibetans’ practice Tibetan Buddhism and the majority of Uyghurs within the Xinjiang Autonomous Region practice Islam. Due to religious similarities, the Islamic Uyghur population is culturally tied to the nations within Central Asia more so than China. The Uyghur population is also culturally tied to Central Asian nations because of a shared nomadic lifestyle. The role of Islam and the geographic location of Xinjiang present several problems for China. First if the Central Asian states attempt to support their Islamic Uyghur neighbors in an independence movement, China could be in for a larger conflict than expected. Also the pilgrimages of Uyghur populations between Central Asia and Xinjiang could result in shared knowledge of violent tactics and/or supplying of weaponry from extremist groups. A Chinese source has argued that over 50 terrorist organizations exist within Central Asia, mostly of extremist Islamic foundation, “…and that more than 500 Xinjiang insurgents had been trained in Afghanistan.” In fact China may be holding on to Xinjiang simply because the region borders Mongolia, Kazakhstan, Kyrgyzstan, Tajikistan and Pakistan. China receives a certain amount of security by lengthening the borders between Mainland China and these nations. Therefore denying independence to the Xinjiang Autonomous Region is partly done for strategic and security purposes. Similar to any political party, independence movements require the leadership of an individual or a group to effectively mobilize and unite the members within the group. The Dalai Lama is the well-known leader of the Tibetan independence movement, and has been in exile since March 10, 1959 when his rebellion failed to gain independence. On the other hand the leadership of the Uyghur independence movement is not as internationally known and has not won any Nobel Peace Prizes. Rebiya Kadeer currently leads both the Uyghur American Association and the World Uyghur Congress, although these two organizations have been unable to successfully unite all Uyghur groups. Movements for Xinjiang independence are fractioned at best, with no unitary financial support or figurehead leading the movement. Several divisions of independence groups exist at the present time: the East Turkistan Islamic Movement, the World Uyghur Congress, and the Uyghur American Association. With no true leadership or unity, goals of independence are out of reach and not always created by common consensus. Different methods of protest between the Uyghur and Tibetan independence movements is also cause for the Tibetan movement being acknowledged relatively more. Unified, easily predictable non-violent protests allow Chinese law enforcement authorities to break up Tibetan protests with ease. However, unified peaceful protests matched with Chinese governmental aggression are effective tactics for building legitimacy and international sympathy. Uyghur protests of Chinese occupation of Xinjiang and the consequences of this occupation, larger Han population in the region, are sporadic, disjointed and violent in nature. Violence used as a method of protest by the Islamic population lead to the effective labeling of Uyghur independence movements as terrorist organizations, which perfectly matched the components of the U.S. War on Terror in the Central Asia region. Due to the cultural, religious, and political differences existing between the Uyghur and Tibetan independence movements, the Tibetan independence movement has received more international recognition. Whether or not these groups can be accommodated within the PRC is unknown, as the Chinese government has only attempted to control and dilute these ethnic groups. However, in order to mobilize and create a legitimate Xinjiang independence movement, the Uyghur population must elect a leader within the Xinjiang population. Although the PRC will strongly oppose this leader, possessing a leader will illustrate a legitimate attempt for independence and will provide a face for the movement. Intentions should be clearly described after electing a leader, in order to avoid confusion and misconceptions, and non-violence methods of protest should be employed in order to avoid labels of terrorism. This leader must use the rich cultural distinctiveness of the Uyghur tradition in order to mobilize the masses to create a unified Xinjiang independence movement. Although the Tibetan independence movement has not arrived at complete success the group provides a strong model for international recognition that should be employed by Uyghur groups within the Xinjiang region. I wish the Uighur people well in their challenge to build world awareness & support for their independence movements. I hope the increasing mobility & flexibility of communication devices like smartphones & minitablets will help Uighurs to evade repressive crackdowns on their protest activities. Of course the Chinese are paranoid about this, so a factually based international spotlight is needed. If Dalai Lama cannot separate Tibet from China with all his aids from the West and the US for more than 6 decades, how can you expect Rebiya Kadeer would be doing any better? She does not even speak English. Do you know why they both have achieved nothing? It is because they have already left their homeland and they become outsiders. What do they know about how people in Tibet and Xinjiang feel? It is easy for these new migrants to obtain financial support from hostile states to survive in foreign countries. However, those people in Xinjiang and Tibet bear the cost. Historically, Central Asia’s economic prosperity has been relying heavily on China’s enormous market. China is still an important trading partner of Central Asia. I do not see why Central Asian states would be so stupid to block its trade with China by helping with Xinjiang independencce. Historically again, Central Asia has always been under the influence of Russia or China. I do not see why Central Asian states would support the US and its allies to separate Xinjiang from China. It was long time ago that people of Xinjiang were living a nomadic lifestyle. Those Uyghur activists in the West are all city dwellers. As for the elected leadership, Dalai Lama was the official leader of Tibet before leaving China. It is so ridiculous a suggestion to have the Xinjiang’s people elect a leader to lead the independence movement. Does Mr. Sinden know what exactly a social movement means? 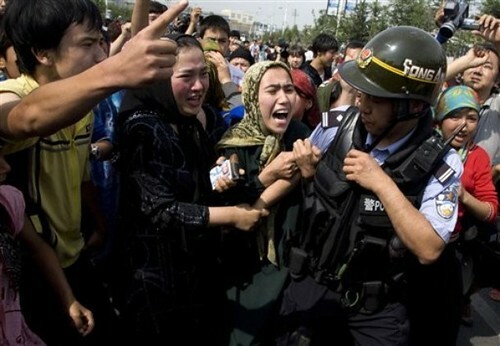 It is not outsiders who are planning what people in Xinjiang should do. It must be a voluntary action of the Xinjiang people. This tell us why Tibet’s independence does not work after 6 decades. It is because social movement is an inner dynamism rather than putting on the hands of those privilege strata who migrated to the West. When Dalai Lama is speaking in English in media of the West, the Tibet people do not understand. When Rebiya Kedar speaks in Uyghur language, the people of the West do not understand. All these independence forces are just alienated from the locality. If people of Tibet and Xinjiang want to rebel, they can do it themselves. China has not sponsored the French Revolution. You people of the West ought to respect we Chinese people’s way to create our history. according to a chinese website/ news i saw is that the dalai lama hides his intentions on western values such as “human rights, democracy” etc. I never knew human rights and democracy were solely western values. the article as a good point on China’s great insistence to keep these territories in order to prolong the borders between central asian nations, russia and india. That’s why it’s also getting the south china sea so it could secure its borders. China needs to become a democracy. Then the world can have a taste of what the Chinese people really think on these issues. A nationwide vote on whether any part of China can become independent is doomed to fail, and with the backdrop of a democracy, the West won’t have much to say. You’re so Chinese nationalist, Mr. Jthk! Chinese won’t and have never been trying to understand uyghurs at all, because you guys don’t really know respecting others. By the way, you Chinese always pretend to be radical, patriotic nation, infact, how ignorant you are!